Jacob S. Coxey, “Jacob S. Coxey,” Histories of the National Mall, accessed April 22, 2019, http://mallhistory.org/items/show/86. 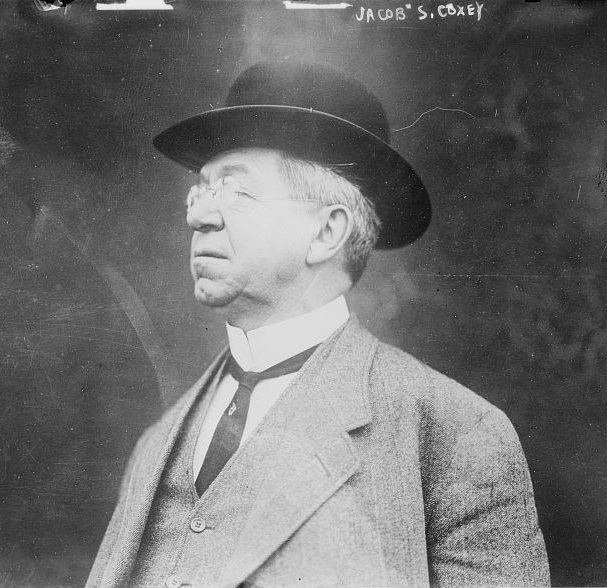 Jacob Coxey led the first march on Washington in the spring of 1894. Starting in Massillon, Ohio, Coxey marched to the Capitol to bring attention to the plight of unemployed Americans. Coxey proposed that the federal government subsidize a labor program for the unemployed. At the time, a law prohibited gatherings on the Capitol Grounds, but Coxey believed in his cause and tried to give a speech. He was arrested and then jailed for 20 days. Coxey returned in 1914 and successfully spoke on the Capitol steps pleading for a jobs program for the unemployed. Jacob Sechler Coxey was born in Pennsylvania in 1854. At the age of 16 he went to work in a mill alongside his father. By the time he left at 24 he had been promoted to engineer. He moved to Massillon, Ohio, in 1881 where he bought a sandstone quarry which he used to produce sand for the booming steel and glass industries. By the early 1890s he also owned a stock farm and racing horse stables. Coxey had a lifelong interest in economic issues. He decided the best way to combat unemployment in the 1890s was to put the unemployed to work improving the roads, and proposed that this project could be financed by federal lawmakers through a bond system. In 1894, with the encouragement of friend Carl Browne, he decided to lead a march on Washington to raise support for his plan. The result was the first ever march on Washington. Coxey spoke at the Capitol in defiance of the law and was arrested. After the march he returned to Ohio and sought public office, continuing to advocate for economic reform. In 1914, Coxey returned to Washington and spoke on the steps of the Capitol without hinderance. He did so again in May 1944, on the 50th anniversary of his historic attempt. Coxey died in Massillon in 1951 at the age of 97. Carlos A. Schwantes. "Coxey, Jacob Sechler." In American National Biography Online. Oxford University Press, 2000.